Have you ever wondered what it takes to be a CEO of a leading company? Where Do CEOs Come From is an interactive app combining a range of background data on current CEOs from across the globe, such as where they were born, where they went to university, the subjects they studied and their previous roles. 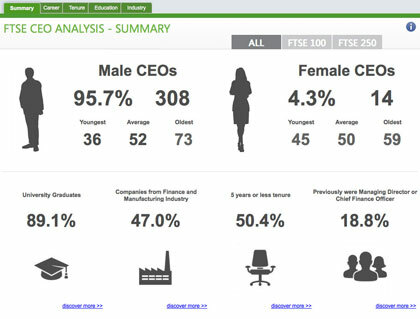 Where Do CEOs Come From is built on QlikView, a user-centric business intelligence platform which enables people to easily discover the hidden stories behind data of any kind. Click the ‘Launch Where Do CEOs Come From app’ button above to have a look at the data yourself and ultimately discover the attributes that make up CEOs from across the globe. QlikTech has made every attempt to ensure the accuracy and reliability of the information provided on this website. However, the information is provided "as is" without warranty of any kind. QlikTech does not accept any responsibility or liability for the accuracy, content, completeness, legality, or reliability of the information contained on this website. No warranties, promises and/or representations of any kind, expressed or implied, are given as to the nature, standard, accuracy or otherwise of the information provided in this website nor to the suitability or otherwise of the information to your particular circumstances. We cannot and will not guarantee that use of this website or app is free from computer viruses or anything else that has destructive properties. We shall not be liable for any loss or damage of whatever nature (direct, indirect, consequential, or other) whether arising in contract, tort or otherwise, which may arise as a result of your use of (or inability to use) this app, or from your use of (or failure to use) the information on this site. This website provides links to other websites owned by third parties. The content of such third party sites is not within our control, and we cannot and will not take responsibility for the information or content thereon. Links to such third party sites are not to be taken as an endorsement by QlikTech of the third party site, or any products promoted, offered or sold on the third party site, nor that such sites are free from computer viruses or anything else that has destructive properties. We cannot and do not take responsibility for the collection or use of personal data from any third party site. In addition, we will not accept responsibility for the accuracy of third party advertisements. QlikTech and the QlikView logos are registered trademarks of QlikTech International AB.